Our premium offer to corporate customers is the private box. An intimate, pleasant comfortable way of treating your guests. 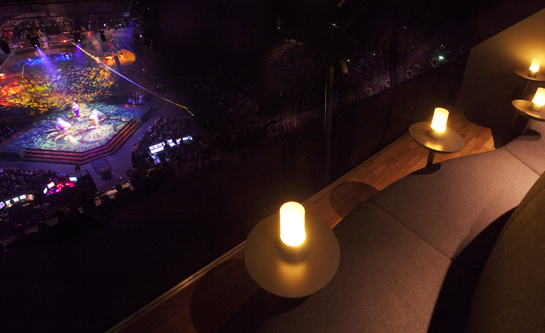 The boxes are secluded and private, but nevertheless at the centre of events and offer an unparalleled view of the stage. The boxes also have their own VIP entrance, elevator and private bar. Dedicated hosts and hostesses will ensure that you have everything you need. Take your pick from amongst all of Oslo Spektrum’s open events, and enjoy fine dining in surroundings guaranteed to create a successful evening for you and your guests. •The option of personalizing the box to promote the corporate image of your organisation. Oslo Spektrum’s aim is to make corporate membership as simple, flexible and entertaining as possible. We provide a unique arena for building customer relationships and a wide range of world class performances. Welcome to Oslo Spektrum – for the big events, we’re unbeatable!